After a brief holiday hiatus the Skyrim Mod Forge is back. 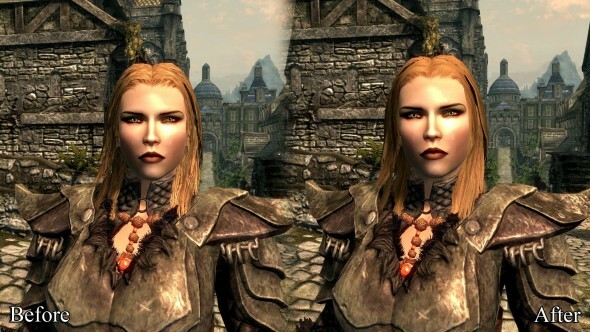 Bringing you some of the best mods produced by the modding community dedicated to improving The Elder Scrolls V: Skyrim. 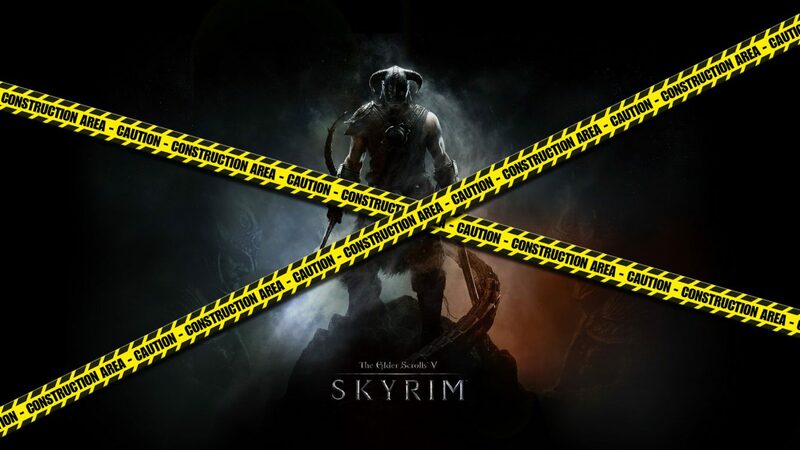 It’s finally January, and while we’re all waiting to see if Bethesda will keep it’s promise of releasing the Creation Kit (that will increase the modding potential of the game exponentially) this month, the community is still using whatever it can to improve the game over the original. There already are nearly 5500 mods available for download, and that’s counting only the ones that I could personally find. 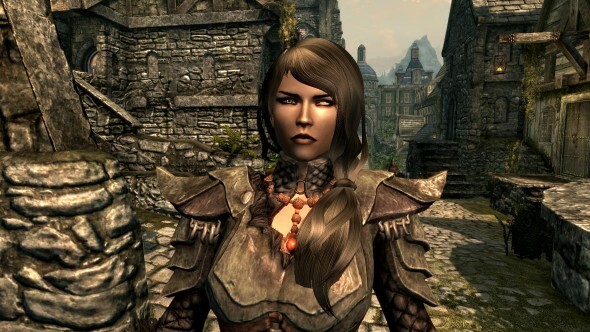 The purpose of this column is to help those that may be a little disoriented with the size and scope of what the Skyrim modding community offers. You’ll find here on DualShockers every Wednesday. But, as every week, it’s time to let the mods do the talking, so without further ado, head past the cut for this week’s highlights. Tired of seeing a lot of beautiful ladies in this column and no handsome men? Me too. Luckily Geonox decided to help by creating this awesome mod. His textures sport not only a much higher resolution and level of detail than the original ones, but they’re also (arguably) quite a lot more palatable. After fidgeting with the character creation for hours I gave up on creating a character that looked anywhere decent, as the result above (on the left) shows quite clearly. I finally applied the Geonox treatment, and check on the right: now that’s a character I can work with. Like every beautification mod, this isn’t for everyone (even if I’m hard pressed to understand how one could like the drab original textures more, but to each his own). If it is for you, you can download it here. If you like your character to be a little more “Highlander” (or just to bathe less) you can also find Geonox’s Dirt Maps and Facepaints here. 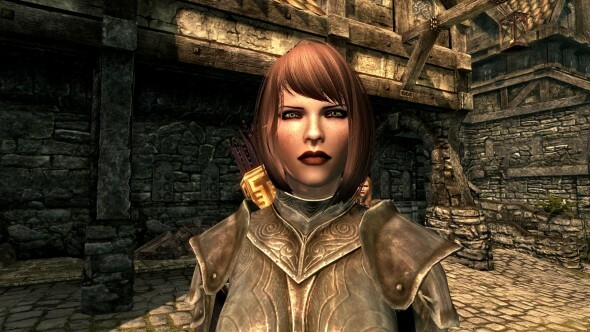 One of the main graphical problems in Skyrim is hair. Hair textures are so low in resolution that every hairstyle looks like a completely unappealing and greasy mess. This mod by AnOldFriend mitigates the issue without even raising the resolution, but by making detail sharper and more defined, reducing the unpleasant greasy effect by a lot. There isn’t much more that can be done without completely replacing the meshes, and if you like the overall look of the original hairstyles this may be the best compromise between keeping them in their messy state and completely replacing them. You can download it here. When something looks bad, increasing the level of detail is the route most modders will normally follow. This mod by Navetsea goes in the opposite direction: it actually softens the hair textures by making lines less sharp and striking and reducing the original greasy effect by a whole lot. It’s the perfect alternative to the one showcased above (of course you can’t install them together) and I encourage you to try both and decide which one suits your tastes better. They both are a large improvement over the original, that’s pretty much for sure. Some would probably define this mod by SteelChi a cheat. I find it rather well balanced with the rest of the game, so I’ll define it a “convenience upgrade”. 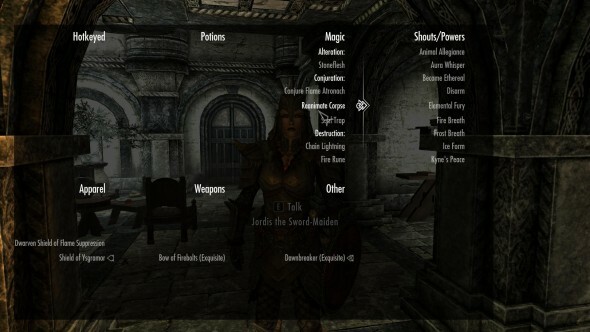 Carried weight limits are extremely restrictive in Skyrim, and this mod adds a few spells that you can purchase and will increase your weight allowance by a limited amount for a limited time, allowing you to get out of those blasted situations in which you’re completely encumbered and can’t even fast travel to the nearest container or shop without dropping some valuable loot. You can download it here. One of my biggest gripes about Skyrim‘s UI is the favorites menu. It makes the whole process of switching weapons and spells extremely cumbersome, and switching between weapons and spells is something you do a lot. Since the game gets paused anyway when you enter the favorites menu, there’s simply no reason for it to be limited to a small window, forcing you to scroll between tens of spells and implements of destruction to find the right ones you need to tackle a given enemy or situation. Well, no more of that. This absolutely fantastic mod by Favmenumodder turns the favorites menu in a categorized, full screen window that will let you browse between your favorites much faster and in a much more efficient way. It works so well that it almost makes you wonder why no one at Bethesda thought about making the menu like this to begin with. You can download it here, and then run to write a love letter to the author. Maybe I should ask Alexa. She’s good at that kind of things. The default map included in Skyrim isn’t bad, but a modder’s favorite motto is that nothing can’t be improved. This mod by IcePenguin does exactly what it says on the tin: It provides a much better and more detailed map to gawk at, and adds roads, helping a lot with navigation. 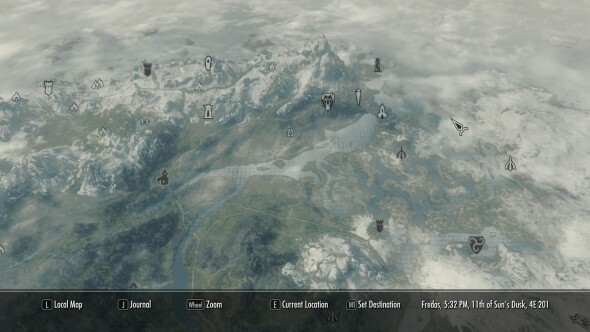 It even has two optional versions of a classic looking paper-like map, for those that don’t really like watching Skyrim from a Google Earth-ish point of view. Do you recognize the lovely lady in the picture above? Bet you don’t. That’s Jordis (the same model I used for the previous mods I showcased in this article) after a quick “surgery” that took about three minutes to do using this great tool by Foretrenty. It’s not a mod in itself, but it allows you to make your own small mods in just a few clicks by changing around basically every parameter of a NPC, from looks to stats and voice. It’s extremely well designed and, as most good tools, it’s easy to use and very powerful in the right hands. I normally don’t use sensationalistic lines like “Become a modder in mere minutes with this!”, but in this case it’s pretty appropriate. You can download it here. Just make sure to read the documentation. A lot of people love freckles. 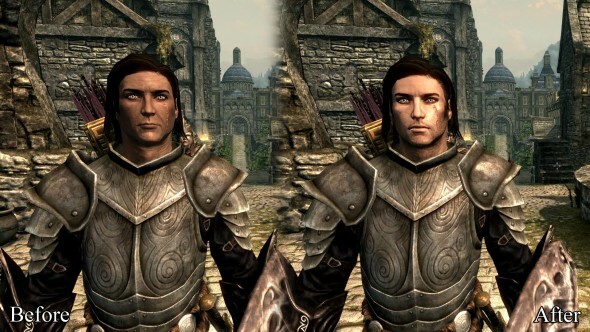 The problem with freckles in Skyrim is that low resolution textures and freckles combined tend to have a rather disastrous “dirt on the face” effect. 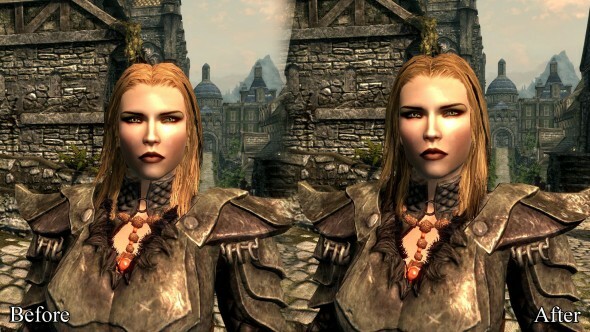 This small but lovely mod by MadCat221 replaces the original freckles texture with a completely new one that sports a much better definition. Problem solved. You can download it here. Anyway, there are several mods out already that include armor imported from the witcher, some are further modded, some in original conditions. 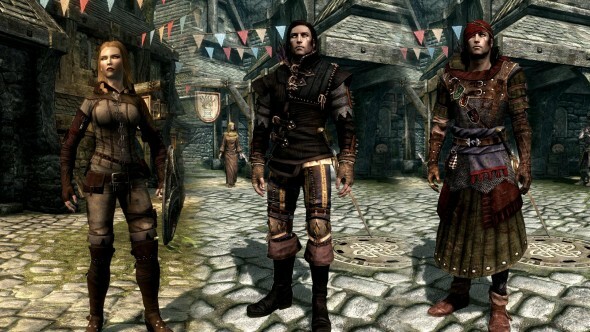 Some replace existing Skyrim armor, some just add over it. You can find Triss’ costume here and here, while the equipment of Geralt and Iorveth can be downloaded here. As you can see from the picture above, not only the models from The Witcher 2 fit perfectly into Skyrim‘s world, given that the texturing style is not too different, but they also look absolutely amazing due to the extremely high level of detail. Thanks to the explicit permission given by CD Projekt, I can easily predict a large number of models from The Witcher 2 imported into Skyrim in the future, especially after the Construction Kit will be released, allowing a better integration and making adding new items into the world easier and faster. As a fan of both games, I honestly can’t wait. And that’s it for this episode 6. I hope you found something useful to improve your game. As usual remember that full and exclusive credit for the mods listed above goes to their talented authors. Do come back next week for more mods at the Skyrim Mod Forge. Read More Episodes of The Skyrim Mod Forge: Episode Zero – Baby Steps, Episode 1 – Large Address, Steady Growth and Lips, Episode 2 – Mod Managing, Beauty and Dragons, Episode 3 – More Beauty, Divorce and Small Details, Episode 4 – Even More Beauty, Fashion and a Better HUD, Episode 5 – Hair, Flora and Weapons from Morrowind, Episode 7 – Swords, Ice, Spells, Fashion and Realistic Light, Episode 8 – Cats, Shouts, Hideouts and Swords from LOTR, Episode 9 – Armor, Soul Gems and More Swords from LOTR, Episode 11 – Companions, Pretty Faces and More from The Witcher 2, Episode 12 – Houses, Lovely Hairstyles and Riding Like a Boss, Episode 13 – Lovely Hair, Armor from The Witcher 2 and Hundreds of Books.